It’s not only severe dental caries that can damage a tooth until it is beyond saving. Gum disease that leads to bone loss is just as dangerous. Gum disease is caused by a buildup of plaque that creates pockets of infection between the gums and tooth roots. This leads to periodontitis, gum recession, and eventual bone loss. A professional cleaning gets rid of the plaque. Even if you brush and floss your teeth morning and night, plaque can accumulate. We have many patients who are observant brushers but are surprised when our hygienist uncovers plaque on their teeth. The Oral Cancer Foundation relates this grave news: oral cancer claims one life approximately every hour—that’s 48,250 deaths a year. The best defense is early detection, which is why our checkups include oral cancer screenings. Your mouth is not a separate entity from the rest of the body, but many people treat it that way. At The Plano Dentist, we’ve often wondered about this disconnect. There is compelling evidence to suggest that the risk of heart disease, stroke, and diabetes increases with poor oral health? Besides, your lifestyle is significantly influenced when you have tooth pain, tooth loss, gum disease, or dentures. Many Texas dental insurance plans cover twice-yearly dental cleanings. Even if you don’t have dental insurance, cleanings are one of the most reasonably priced ways to maintain ideal oral health. 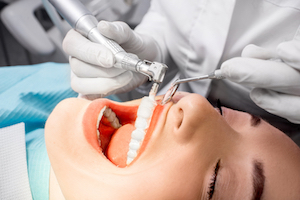 The Plano Dentist offers general and cosemtic dentistry, and many other services. Schedule your next checkup with us today. For Accurate Dental Info, Just Ask!